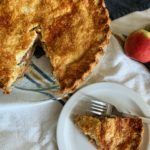 Last year, I made an apple pie for Thanksgiving. I was so excited, because this was my first time making an apple pie and I wanted to nail it. Off I went to the store and to pick out a mixture of apples for the middle. I don’t remember every kind that I grabbed, but I remember grabbing the honeycrisps. Guess what I learned? Honeycrisp apples aren’t good for baking. Well, at least not for my pie. The middle was more juicy than I wanted, and the pie was a little sloppy. I mean, the honeycrisp apples in the middle tasted amazing. But they aren’t ideal for the situation. Lesson learned! This year, I was determined to get a great apple so I wouldn’t have the same mess. I went to a local fruit stand in Cache Valley, Utah, and at their recommendation, grabbed some Cortland apples. Wooo-eee, are they awesome for baking! I have been having a blast baking with these apples. 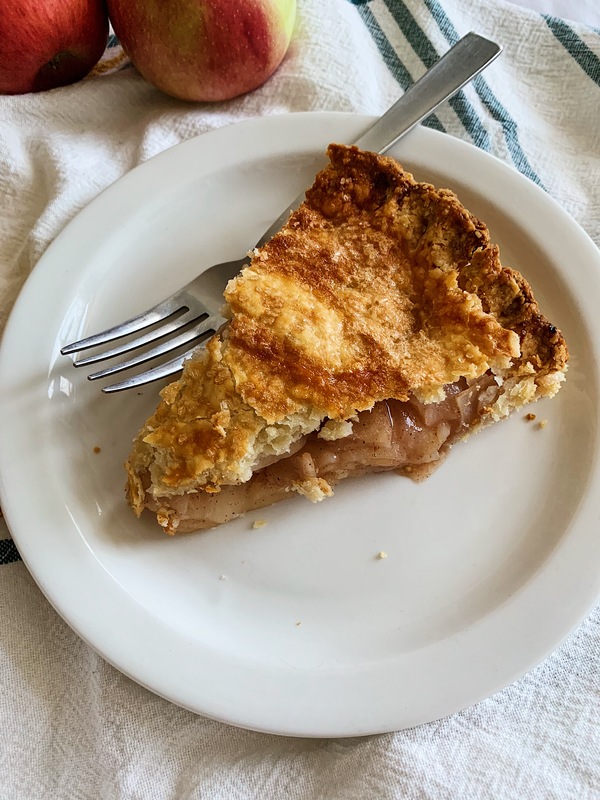 I have been experimenting with making the perfect apple pie, and dare I say that I’ve got it? What kind of apple should you grab? One of the biggest things you’ll want to get right, like I’ve mentioned above, is a great apple. If you’re at a local fruit stand grabbing some fresh ones, ask them what their best baking apple is. 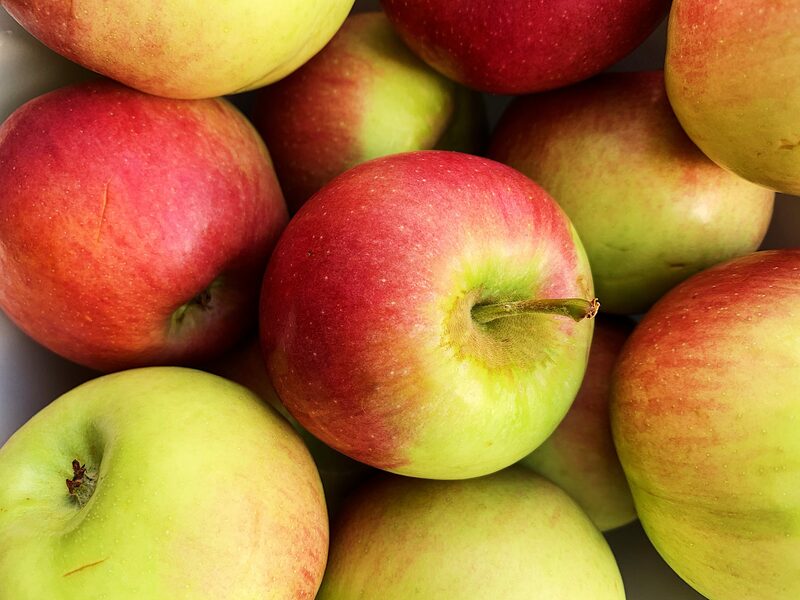 If you’re at the store, you’re probably safe grabbing some Granny Smith for this recipe. And can we talk about the crust? It is so easy, but so flaky and perfect. For the longest time, I didn’t like pies. As it turns out, I just wasn’t eating pies with good crusts. Make the pastry yourself and you’ll see a huge difference, people! When you are making the crust, it’s important to keep everything as cold as possible. I use a food processor to make mine, which is nice because you can get it whipped up quickly. On the other hand, you can risk overworking the crust. So you only want to the final pulse to go until a few big almond-sized pieces of dough start to clump together. If you don’t have a food processor, a pastry cutter works great, too! 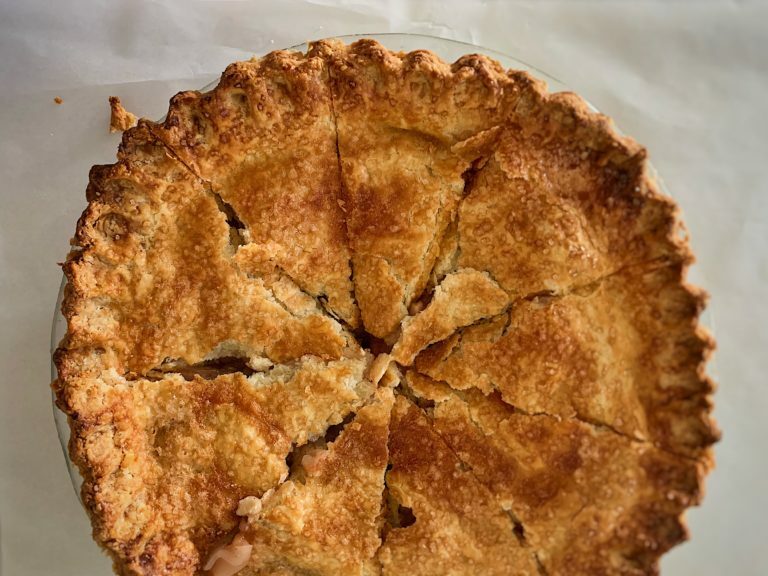 This is a totally delicious, yet doable version of this classic American pie. Place the butter pieces into a small bowl and put in the freezer for 10-15 minutes while you work on the rest of the crust. In the bowl of your food processor, add the flour, sugar, and salt and pulse a few times until incorporated. Mix together the sour cream and 1/3 cup of the ice water in a small bowl. Gently scatter the cold butter pieces over the flour mixture in the food processor, making sure there are no large clumps of butter pieces. Pulse until the butter pieces are about the size of peas, up to ten pulses. Add half of the sour cream mixture and pulse until incorporated, 2-3 pulses. Add the rest of the mixture and pulse 2-3 more times. To test if the dough is ready, pinch a small amount between your fingers. It should clump together if it is ready. If it is too dry to stick together, add more ice water in tablespoon increments until it is ready. Pulse until the dough is starting to form larger clumps. Dump the crust mixture onto a well-floured work surface. Divide the mixture in half and work each half into a ball. Wrap each half tightly with plastic wrap and place in the fridge to chill for at least 30 minutes to an hour. Combine all filling ingredients into a large bowl and stir well to coat. Set aside. Adjust the oven rack to the lowest position and preheat oven to 500 F.
Remove the dough from the fridge. On a well-floured work surface, roll one of the halves out to about 12 inches. Place inside the pie plate, making sure it is pressed into the edges and there is enough to hang over the sides. Roll out the other half of the pastry to 12 inches as well. Place the apple mixture inside the shell and press lightly to make sure the apples are in there nice and tight. You can arrange the apples if needs be. Just make sure there are no large air pockets. Place the other half of the pastry over the top and crimp the edges. Cut a vent hole in the middle. Lightly brush the top with the egg white and sprinkle evenly with the raw sugar. Cut a vent hole in the middle. Remove from the oven and let cool for several hours before eating. The apple pie will bake best of the apples are sliced thin and packed into the plate so there are no gaps. Using a mandolin helps to get the apples sliced thinly for this purpose. You'll need a deep dish 9" or 9.5" inch pie plate for this recipe. I hope you love this recipe, and especially this Thanksgiving baking season!